"Phoenix Wright: Ace Attorney stars Phoenix Wright, a rookie defense attorney in the Fey and Co. Law Offices, owned by fellow defense attorney Mia Fey. The game features five court cases divided into episodes. Each case flips between two game modes: investigation and the actual trial. 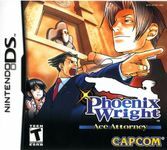 In the investigation aspect of the game, Phoenix gathers evidence and speaks to characters involved in the case. In the trial aspect of the game, Phoenix defends his client using said evidence, cross examines witnesses and solves the mystery surrounding each case. The court perspective is usually in the third person, while the perspective outside of court is in the first person." Source: Wikipedia, "Phoenix_Wright:_Ace_Attorney," available under the CC-BY-SA License.